If football’s just a game then we seriously need to revise our definition of ‘play’. And the word ‘just’ depreciates it even more. In many ways, we are all in constant denial, refusing to grow up and leave the child within us behind, and it is through play that this psychological baggage can take the form of a pleasure we can share as opposed to a limiting belief we need to shed. And we all do it, in one way or another. Have you ever smiled this much? Sport has long worked in both ways for me, and either through participation or observation I’ve found either solitude or company. And I’ve experienced the pain of defeat, the disappointment of underachievement, and the highs of victory. As all winners will tell you, few things come close to the elation of victory, and many people will continue to rate a moment of sporting glory among the most precious of their lives. We shouldn’t be too surprised. A lot of adrenaline goes into sport, and we invest a lot of energy in it. Winning can be quite a release. It can rouse pride, joy and relief, passion, hope and indignance. Can you imagine that shared across an entire nation? A solitary runner may yell when he breaks his personal best, but what does this matter to anybody but himself? Yet give victory meaning, share it, make it the sudden realisation of 60 million dreams, and it gives a shared happiness that nothing on this planet can match. Nothing! Even things that, in all honesty, are far more important. 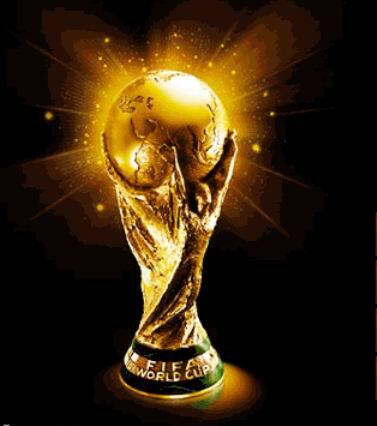 My happiest, greatest, proudest and most memorable moment was sometime back in 2006 when I was able to stay, rent free, totally off duty, for the last ten days of the World Cup. Fate played a big hand in my staying for the final. I had been due to leave for a job in Cambridge but it all went very wrong. Grazie a Dio! The job was put back two weeks so I stayed on for another week to finish a summer school job near Verona. But I didn’t take my flight home because we got to the semi-final. And a few days later I skipped another flight when we beat Germany, so I could see the final there. I was in Piazza Bra’, Verona. I don’t believe in regret, but it still chills me to think that I so easily could have been out of Italy that night. And it would have stayed with me forever. 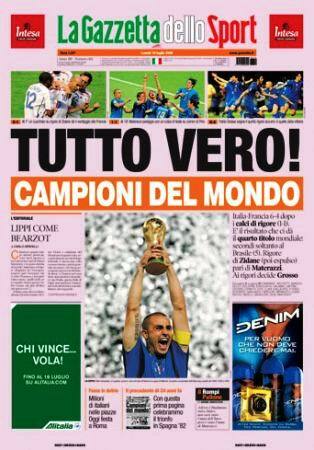 Fancy a lifetime breaking into a cold sweat every time you hear the word Cannavaro? No, neither did I? Instead, I lived a gradual rise of expectation and belief, and felt a shallowing and quickening of collective breath as we firstly disposed of Australia (no, I know it wasn’t a penalty) with only 10 men on the pitch; then Ukraine, an easy 3-0, and Germany in the semi-final. 2-0 was a fair score in some ways, as the Italian goals were both absolute gems. The second goal was a confirmation and not unexpected. But the first came like a lightning bolt from nowhere. An end to end game had seen neither side gain a clear advantage, but then Fabio Grosso’s gift to his country could only be matched with that which he gave in the final. For a week, Verona was a hive of near hysteria as faint hopes turned to strong expectations. Frustration passed through swift forgiveness to eager anticipation and by the time the final came the town was unable to think of much else. Even the precious opera season at the Verona Arena was secondary, in spite of the town’s efforts to reduce disturbance of the performances. Although a perfectly reasonable course of action, in some ways, closure of the square to vehicles doused the flame a bit. 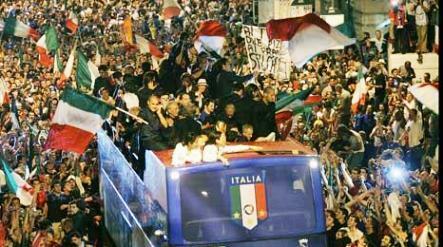 The drive-by party after the semi-final had twice the energy of the victory celebrations. If you know of anything that leads to parties like this, please let me know, cos I wanna go! The game against France was hardly a great advertisement for football. So many players were off song, Totti, Henry... even the famed Zidane only did one thing (and we sure had a few songs for him that night, not exactly repeatable here but we didn’t care) and the French had to face the penalties without him. But French sympathists will always claim that losing Zidane was the reason France lost the World Cup. What? He played for almost two hours, and did nothing. It was Trezeguet who cost them the win. Oh, and the fact that Italy are simply better, more stylish, attractive, and semplicemente tutto! It’s quite an amazing thing to be in the midst of such social ecstasy. Just as darkness cannot exist in the light, lethargy and depression cannot endure within an abundance of exultation. 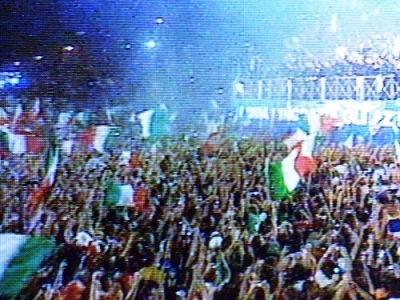 For one night, sadness did not exist in Italy, it simply wasn’t strong enough. Perhaps one day I will find something that means more to me. But probably never anything that will make me ashamed to say that it was the greatest moment ever, at the time and for many years after. And where better for it to have happened?